Jason and I hosted our 2nd annual Halloween party this weekend. I really had a blast decorating this year. I wanted to spend as little money as possible, so I limited my purchases to streamers, balloons and scrapbook paper. It was fun to deck out my dungeon-y basement with over 100 balloons and hand made pennant banners. 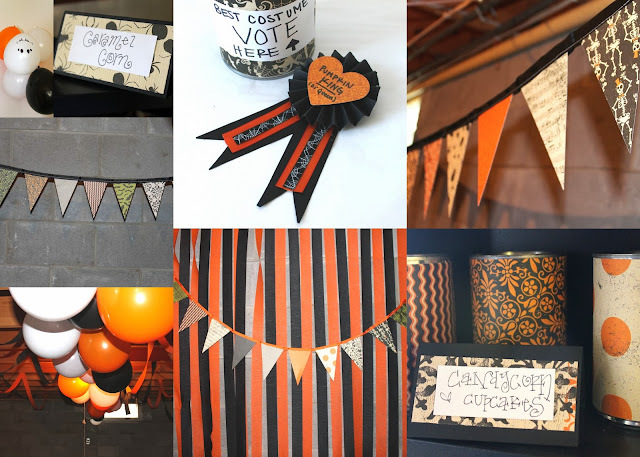 I also covered old tin cans in Halloween themed paper, and made cute little food labels that I had my guests write on with the name of the dish they brought. My guests really got into the spirit of the decor and used their fanciest handwriting!